This is a book about an ancient writer, the J writer--the Yahwist--who produced a work of political imagination. This work is embedded mainly in the first four books of the Bible, best known for some of the most popular and influential biblical stories in Genesis and Exodus. The purpose of the book is to represent the whole of the original story with attention to its own meaning, without the influence of the other literary strands with which it was later supplemented. Therefore the work includes a fresh, complete translation of the text of the J writer, who produced the Bible's first history. The translation itself helps to establish more clearly than ever the integrity of the J writer. The concern here is WHEN and WHY this history was written, especially in light of the concerns for justice and prosperity. Throughout it is demonstrated HOW and WHY this history comes from the court of David; it is a royal history of David's subjects as though they were descended from pastoral nomads such as Abram, Isaac, and Jacob. It is argued that the intended audience of the history was probably those bedouin who regularly visited the court of David in Hebron and Jerusalem. Here is a bold and brilliant representation of the J writer's composition, perhaps as it was originally intended to be read or heard. This ancient tour de force takes on new life in the hands of these skilled interpreters. ""This is a well-structured and incisive presentation of a distinctive view of J as a work within the milieu of David's early 'bedouin' context. It presents a viable interpretation of J's location and bias applied effectively to a sustained reading of the document as a whole. There are few scholarly writings that treat their subject so lucidly and playfully and are a pleasure to read. 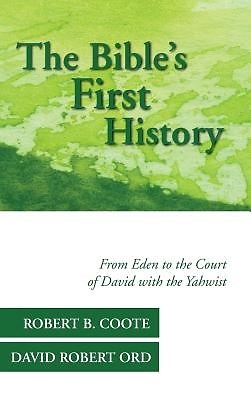 Read this one "" --NORMAN K. GOTTWALD Robert B. Coote is a Professor of Old Testament at San Francisco Theological Seminary, San Anselmo, California. David Robert Ord is pastor of Trinity Presbyterian Church, Jonesville, Louisiana.